Juliette Fordon Low founded the Girl Scouts of America in Savannah, and every year thousands of green-sashed girls make their way to our city to see where it all began. I loved everything about being a Girl Scout, from roasting marshmallows to telling ghost stories and, of course, "making new friends and keeping the old." This pie pays homage to the Girls Scouts. I love camping, but these days it requires Airstream trailer in tow. Position a rack in the lower third of the oven and preheat the oven to 350 degrees Fahrenheit. In a medium bowl, blend together the graham cracker crust crumbs and brown sugar. Drizzle in the butter and mix with a fork until the crumbs are evenly moistened. Press the mixture evenly over the bottom and about halfway up the sides of a 9-inch pie dish. Bake for six to eight minutes, until lightly golden. Let cool completely before filling. Whisk together egg yolks, sugar, cornstarch, and salt in a heatproof bowl until thick and pale in color. Set aside. In a medium saucepan, bring milk to a gentle boil. Whisk about half a cup of the hot milk into the egg yolks to temper them, so they won’t curdle, then, continuing to whisk, add the remainder of the milk in a steady stream. Set the bowl over a medium saucepan of simmering water (do not let the bottom of the bowl touch the water) and cook the egg-milk mixture, whisking constantly, until thick and glossy, five to seven minutes. Remove the bowl from heat and whisk in the vanilla and melted chocolate until well combined. Let the filling mixture sit for two minutes to cool slightly, then whisk in butter until the custard is smooth and silky. Place a piece of plastic wrap directly on top of the chocolate filling so that a skin does not form and let cool for 30 minutes, or until it reaches room temperature. When the filling has cooled, pour it into the prepared crust. Cover the pie with plastic wrap and place it in the refrigerator to chill for at least three hours, or overnight. Transfer the mixture to the bowl of a stand mixer fitted with the whisk attachment (or leave in the same bowl if using a handheld mixture). Add the vanilla and, starting on low speed, whip the egg whites, gradually increasing the speed to high, until the marshmallow topping is glossy and forms stiff peaks, five to seven minutes. Fit a pastry bag with a large plain tip. Fill pastry bag with the marshmallow topping and pipe it over the entire surface of the pie, making sure it touches the crust all around. 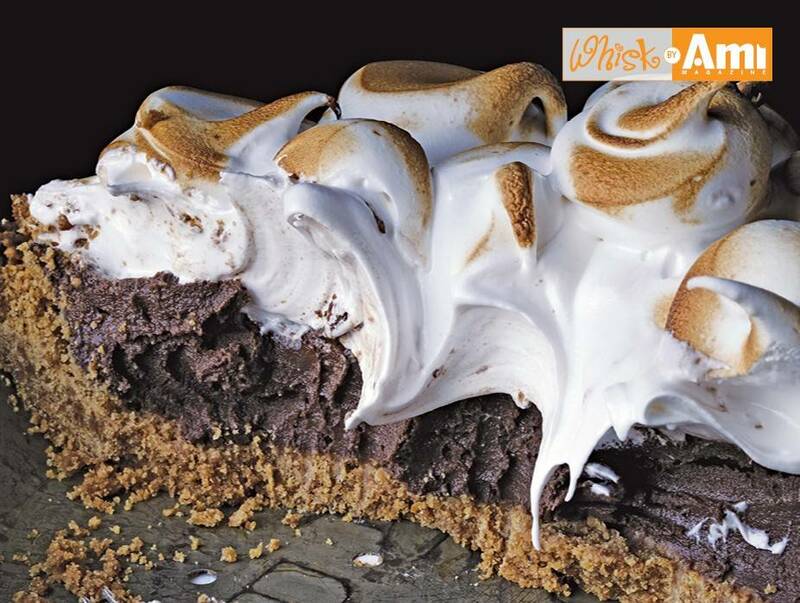 Loosely pile the rest of the marshmallow topping on top and use a spatula to spread it in big, luscious swirls. Toast the topping lightly with a kitchen blowtorch. The pie is best served the same day, but it can be covered with plastic wrap and refrigerated for up to three days. If you don’t have a pastry bag, you can frost the pie using a spatula. Reproduced from The Back in the Day Bakery Cookbook by Cheryl and Griff Day.